The number of paradoxes in the centrally-planned market just keep on piling up. As we reported yesterday the BBB-rated universe of lowest-rated IG corporate bonds, some $3+ trillion and most in danger of being downgraded to junk just had their best quarter since 1995 (alongside most other soaring assets). 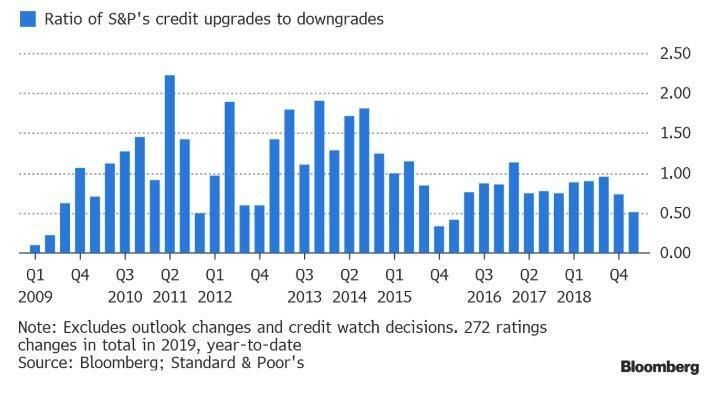 Meanwhile, despite the blistering return of the lowest-rated IG debt, concerns of massive downgrades are starting to be realized: according to the latest S&P data compiled by Bloomberg, the first quarter saw the most credit ratings downgrades for U.S. companies relative to upgrades since the beginning of 2016. The Q1 downgrade wave was sprearheaded by several prominent names as major companies including utility PG&E, retailer J.C. Penney and entertainment giant Walt Disney all had their ratings cut "in a quarter that saw nearly two downgrades for every upgrade." Worse, the ratio dipped for both investment grade and high yield bonds, with downgrades outpacing upgrades for higher quality issuers for only the fourth time in the last twelve quarters. And now for paradox #2: despite lackluster performance in March, U.S. leveraged loans just had their best quarter since 2010. According to Bloomberg, the floating-rate asset class has returned about 4% year-to-date, which while trailing both investment grade and high-yield bonds, is a far cry from the near bidless market loans experienced at the end of 2018. Most of the first quarter’s robust leveraged loan return came from a January rally that followed a steep sell-off in December: in March, the S&P/Leveraged Loan Total Return Index fell 0.17%. 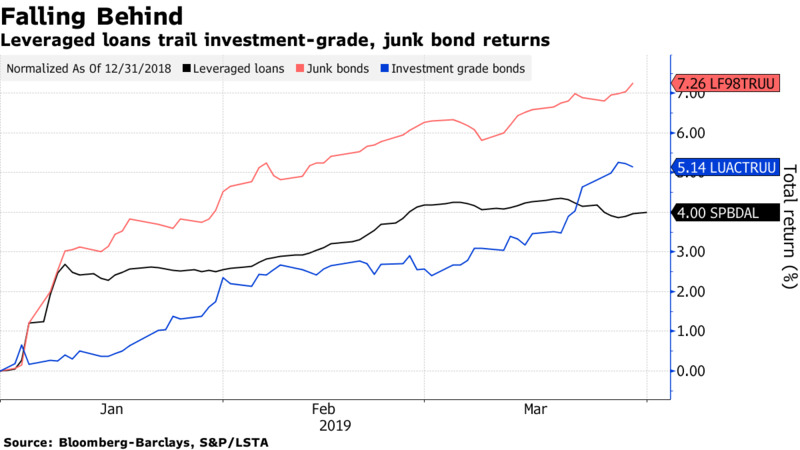 Yet where the paradox emerges is that as the Federal Reserve "paused" its rate hikes for the time being and reversed to a more dovish monetary policy, investors have soured on leveraged loans - which they had been buying as a hedge against rising rates - and are turning to junk bonds. 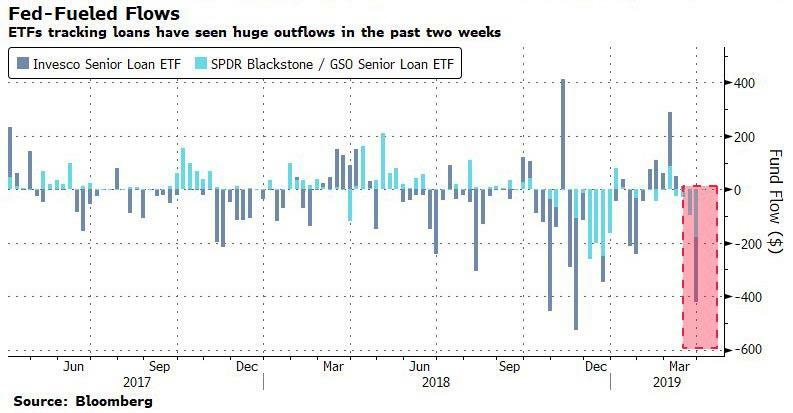 This can be seen most clearly in the ETF flows, such as the Invesco Senior Loan ETF, or BKLN (which we profiled previously) and which lost more than $423 million in assets last week, while investors pulled close to $180 million from that other loan fund, the SRLN, State Street's SPDR Blackstone/GSO Senior Loan ETF. The funds also were the worst-performing fixed-income ETFs for the week, according to data compiled by Bloomberg Intelligence. 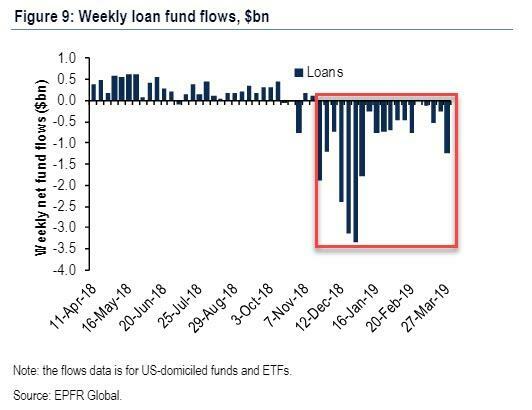 ... but it has the remarkable track record of not having a single weekly inflow since early November: 19 consecutive weeks of outflows, as the following BofA chart shows. 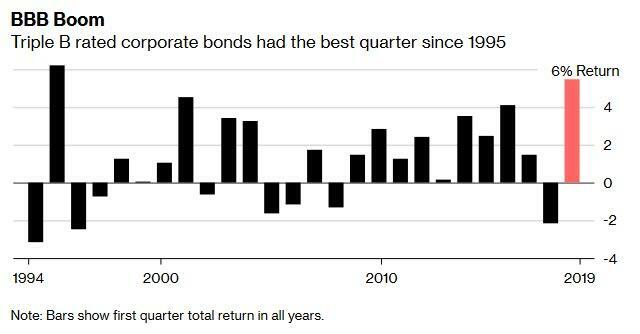 So here's what has happened so far in 2019: first, investors couldn't get enough of the most risky Investment Grade debt category, which just enjoyed its best quarter in 24 years even as the number of bond downgrades surpassed upgrades by the most since 2016. Second, and even more bizarre, while hardly the best performing asset class in Q1, loans still returned a respectable 4% YTD even as investors pulled money from loan funds for the entire duration of this ramp higher in loan prices, a carbon copy of what has been observed in equities, where besides one week of inflows, US equity funds have seen nothing but outflows since January 1.